Three miles south of Norris Geyser Basin, the equally large but generally less active Gibbon Geyser Basin contains several dispersed collections of thermal features of which the most popular is Artists Paint Pots, a group of over 50 springs, geysers, vents and especially mud pots. These exhibit varying shades of blue, grey and brown, and have a range of different textures, with the behavior changing during the year depending on the amount of subterranean water. All the active features can be seen via an easy 0.6 mile trail through partly wooded land - mostly level apart from a short climb and descent across the hillside overlooking the basin. Features along the trail (mp4; 1:27 min; 13 mb). The Artists Paint Pots trailhead is reached by a little side road, ending at parking area that although quite large, still often fills up on busy summer days. The boardwalk path crosses bushy flats to the start of the loop around the hot pools, at the base of the north side of Paintpot Hill. 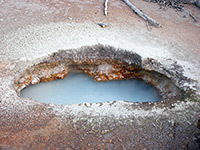 Turning right, the first features are a number of gently simmering milky-blue pools, edged by reddish sulfur deposits. 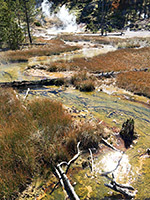 Next are various smaller vents, as the trail climbs a short distance up the hill though new growth lodgepole pine trees and turns east, past perhaps the most unusual pool in the area - a big creamy-brown mud pot with several churning vents behaving slightly differently owing to the varying consistency of the mud. This part of the path is high enough to overlook many square miles of the surroundings, from the hot pools below, across the Gibbon River Valley towards more distant active areas on the far side of Gibbon Meadows. 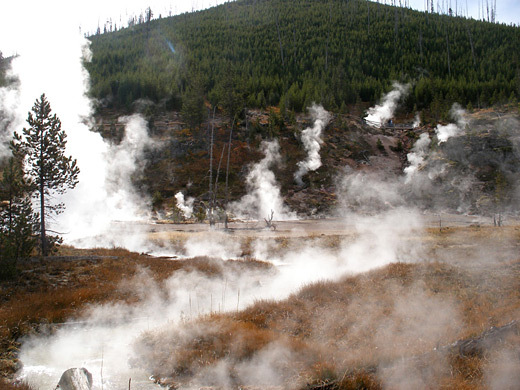 The hillside has other small pools and steam vents, before the trail descends and meets two forceful pools (Blood Geyser and Flash Spring), both constantly bubbling, creating much steam, and occasionally staging a proper eruption. 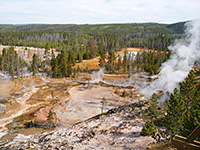 Blood Geyser gets its name from the bright red-orange sulfur deposits surrounding the vent. The end of the loop section of the trail is reached in another 250 feet, after a few other equally steamy pools. 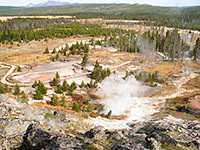 There are plenty more hot springs nearby, some visible through the trees, and a larger area lies out of sight on the far side of Paintpot Hill (Geyser Creek Group), and although numerous warning notices caution against leaving the official path in this location, the springs can be reached by cross-country hiking, starting from the main road.